Is there a better alternative to SubRosaSoft Drive Cleaner? Is SubRosaSoft Drive Cleaner really the best app in Optimizers category? Will SubRosaSoft Drive Cleaner work good on macOS 10.13.4? 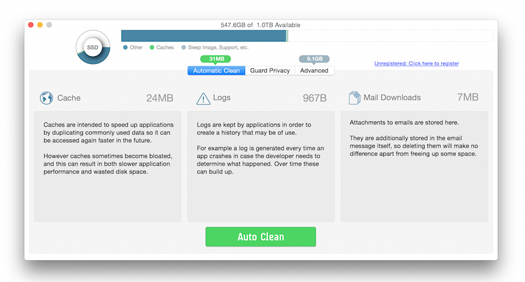 Drive Cleaner from SubRosaSoft helps you free up valuable space on your drive by removing gigabytes of nonessential or temporary files. Optimized for OS X 10.10 Yosemite, SubRosaSoft Drive Cleaner can reclaim wasted disk space with a few simple clicks. You can choose from over half-a-dozen categories to clean and regain an average of 10 GB of disk space and remove a few hundred thousand files quickly and easily. SubRosaSoft Drive Cleaner needs a review. Be the first to review this app and get the discussion started! SubRosaSoft Drive Cleaner needs a rating. Be the first to rate this app and get the discussion started!